You are at:Home»Health»Is There a Secret to Fresh Breath? Naturally? Is There a Secret to Fresh Breath? Naturally? It is funny the things that we will talk about easily–world affairs, money issues, pressing human needs but almost no one wants to talk about bad breath. Yet bad breath is a problem that millions of us suffer from. And we are not talking about the occasional bad breath following a garlic pizza fest, but the chronic, stinky, ongoing type of bad breath. Just in America alone, it is estimated that we spend billions each year on bad breath related products. The sad part is that most of these products are cover-ups and don’t address the real source of chronic bad breath–bacterial overgrowth in the mouth. The simple fact is that bacteria are super survival machines. They have been around for eons and are built to survive. Tooth brushing and flossing helps to disrupt the bacterial life cycle BUT they come right back within hours. Even with antibacterial mouthwashes, their effect is temporary at best as the bacteria grows right back–often with the “bad” stinky guys growing back stronger than ever, creating a dwindling spiral of increasingly bad breath. In simple terms, certain bacteria produce stinky gases (as well as harmful acids). These gases smell like rotten eggs (or worse) and it is next to impossible to effectively kill off these bacteria without causing yourself serious harm. But, no worries, there is hope. The answer lies not in broad-kill solutions that simply wipe out bacteria and that can seriously upset your mouth’s healthy bacterial balance over time. The answer lies in rebuilding and restoring the balance in your mouth. It is best to do this naturally, as chemicals and drugs rarely do the trick. (Note–we do not advise against the use of medicine for an infection or acute need). One such natural approach is by using essential oils that can inhibit the growth of the stinky bacteria, but at the same time are relatively neutral towards the good guys. Sounds too good to true, perhaps, but nature has provided us with essential oils that can actually accomplish this! And, even better, these oils also smell fantastic so they give fresher breath while helping your mouth to rebalance and control the bacterial overgrowth. Studies have shown that certain essential oils have the power to control and inhibit the growth of bacteria. In many cases, this use of essential oils goes back centuries and can be found in many folk medicine remedies. However, in treating oral issues, it is important to find and isolate which essential oils would discourage the overgrowth of “bad” bacteria without causing equal harm to the good guys in your mouth. Remember, you aren’t trying to kill off all bacteria, you are working to rebuild a healthy BALANCE in your mouth. Plus, these oils would have to be safe to put in your mouth, have an acceptable flavor (no one would use a super yucky tasting oil blend) and would have to have a proper blend of oils to be effective. Thankfully, you don’t have to do the work and research involved as a leading holistic dentist from California has taken care of that for you. 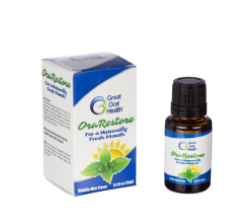 This product is called OraRestore, and it is sold by Great Oral Health both on Amazon and on their website (www.greatoralhealth.com). Spearmint, Peppermint and Tea Tree oils (all organic and natural) have been meticulously blended in an almond oil base with a proprietary flavoring component added for a super fresh taste. The oils go to work to help control bacterial overgrowth while providing an instant breath freshening boost. And, as an added bonus, with less acid-producing bacteria in your mouth, you are reducing the prime factors underlying most tooth decay and gum disease. It is super easy and convenient to use. Throw a few drops on your toothbrush and you have a liquid toothpaste, r a few drops in water and you have a mouthwash or rinse. Or just place a drop or two on your fingertip and rub over your gums after eating or sugary treats. It is so useful while traveling, at work, on the road and of course at home. Great Oral Health was founded by a holistic dentist, Dr. Paul O’Malley, with the mission of transforming the field of oral health, and overall well being, with enlightened and effective oral health care products. You can visit them on the web at www.greatoralhealth.com or on Facebook at www.facebook.com/greatoralhealth. Great post, something everyone has gone through. Even when we try and watch what we eat to avoid bad breath, we subconsciously think about it. Carrying around gum, tic-tacs, or mints I find only fixes it temporarily then leaves you with that nasty residue on your teeth. I like that it provides the relief of bad breath PLUS bacteria. Oh my gosh, this post could not be more timely. I have tonsil stones and have been super paranoid about bad breath. I need to try this. You have no idea how grateful I am for finding this post. I never knew that essential oils could work so well. I have to check this brand out. It beats telling people that their breath is not so fresh! I want to order a bottle of this for my daughter. She can brush her teeth three times and still have horrendous breath. I hope this helps. I’ve heard that different essential oils can stop bacteria from growing. I didn’t know you could use to stop the bacteria that causes bad breath! Very interesting – I’ll look into OraRestore. Sounds like a much healthier option than just covering it up! This is a great article filled with really great info. I think we have all had days that we had yucky breath. And sometimes there are people that just always have that issue. Great option for sure. I tell my kids every day they have the worst breath ever! I love the fact we can turn to essential oils and not gum or candy. Now this makes me wonder what mine smells like! I do not suffer from bad breath. I will say though it might be a great stocking stiffer for some of my family members who do have it. This is a great article! It is really informative, and people who read this will surely gain knowledge about keeping their breath fresher and what causes bad breath.